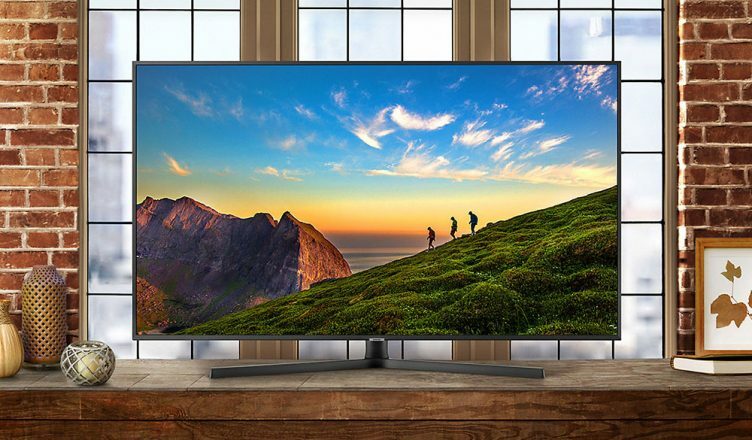 Samsung are certainly forerunners in the TV race and their 2018 range of Ultra HD TV’s have an innovative design and are loaded with useful features. 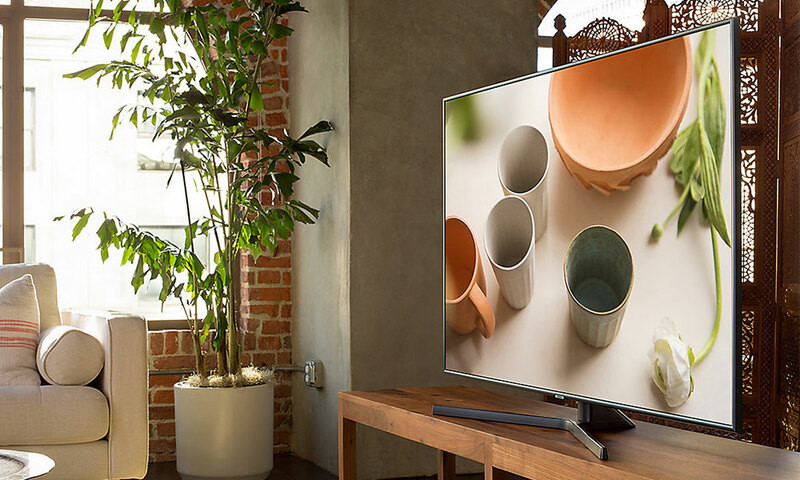 The Samsung NU7400 series all feature Samsung’s Dynamic Crystal Colours which is a fancy way of saying this TV can produce over 1 billion colours. That’s 64 times more than conventional Ultra HD TVs. Featuring the next advancement in HDR technology with HDR10+, HDR10+ makes sure every scene is optimised for colour, contrast and this gives you much better detail and definition. 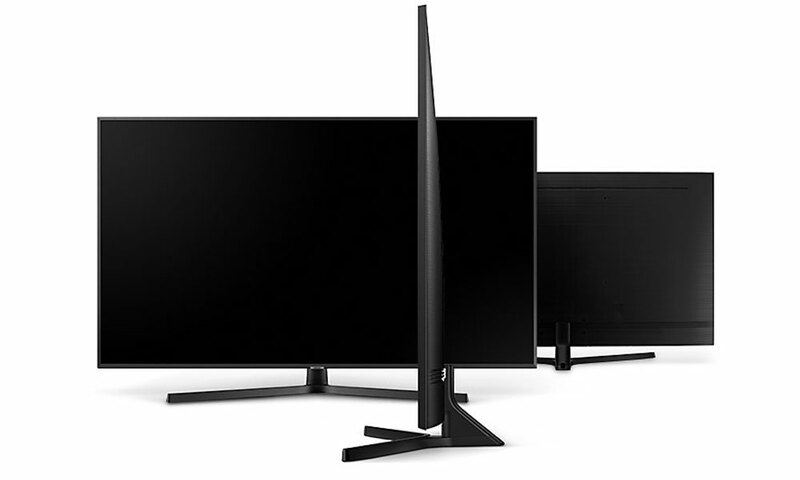 With this range of TVs, Samsung have added UHD dimming which divides and processes the screen into small blocks which delivers more precise details so your films or games look sharper than ever before. Sick of messy cables, I think we all are. The NU7400 range use a clean cable solution built into the stylish looking centre stand. All you have to do is feed the cables along the back of the TV and into the stand. The stand has a slot at the back to allow the cables to run to your devices without cluttering up your stand or desk. Talking of messy cables, the TV also features 3 HDMI ports allowing you to connect a wide variety of HDMI comparable devices. There are also 2 USB and a component-in port. There’s also built in Freeview and Freesat connections giving you the best of both worlds when it comes to terrestrial TV. Another space-saver and de-clutter feature is the new One Remote. The One Remote is able to auto detect other devices and label them, meaning you only need to use one remote, so there’s no need to worry about trying to find several different remotes or having to replace several sets of batteries. However, if you are not overly interested in the One Remote it also comes with the standard style Samsung Remote which still gives you all the main features you’d expect from a TV remote. The One Remote also features voice control allowing you to control the TV with your voice. All you need to do is hold down the dedicated microphone button at the top of the remote and you’re able to change channel, volume or just load up your favourite videos on YouTube or Netflix. 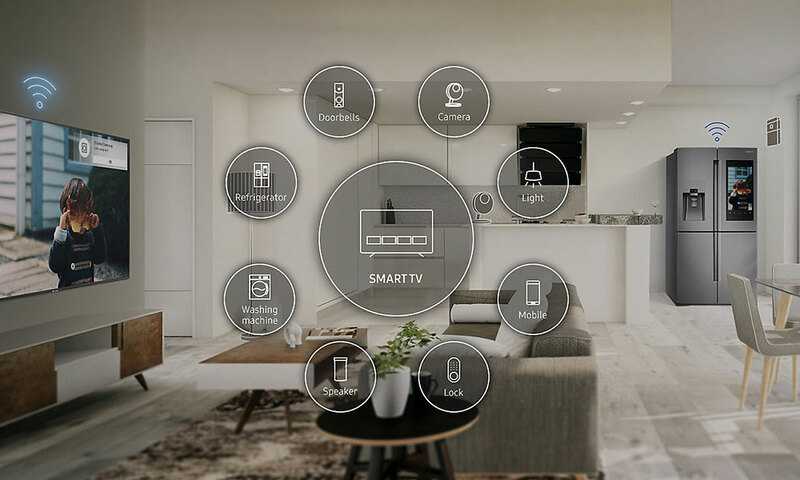 Samsung Smart Things allows your TV to connect compatible smart home devices (such as your fridge, washing machine, security cameras, lights etc.) This allows you to receive notifications on the TV itself. You’ll never have to worry about whether or not your washing machine has finished its cycle; as soon as it’s finished you will get a small pop-up notification in the top corner of the screen with the relevant messages. You can also download the Smart Things mobile app allowing you to also receive the notifications on your mobile. The Samsung Cloud allows you to seamlessly connect your Samsung TV to your mobile phone allowing you to share photos between devices. If you are a PC gamer like I am, the NU7400 range has Steam Link built in which lets you play your favourite PC games like PUBG or the new Jurassic Park game on your brand new 55” 4k screen allowing a much more immerse experience and giving you a higher chance of earning the ever elusive chicken dinner. This TV is also perfect for console gamers whether it’s the PS4 pro or the Xbox One X. Even great for the more family friendly Nintendo Switch due to the larger screen size and many of the Nintendo Switch games such as Mario Kart using split screen, as many as 4 players can comfortably play with ease and without having to squint to see their portion of the screen. The NU7400 is not just available to buy in a 55 inch screen, you can also rent it for £10.38 per week. It’s also available to buy or rent in the larger 65 inch as well as the smaller sizes of 50” screen (available to rent for £8.77 per week) and 43 inches (available to rent for £6.00 per week). With so many sizes to choose from, it’s not just perfect for your living room / (wo)man-cave; it would make a great 2nd TV for either the kitchen or bedroom.